The Predator Rugby Kit leisure range is designed as diligently as our training and playing range. Made with high quality 300gsm polyester-cotton, your custom hoodies will be retail quality with hood, thick drawstrings and kangaroo pocket as standard. 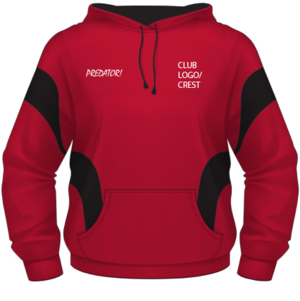 Embroideries and heat transfers are available to add your club and sponsorship logos. Further customisation can be achieved by using contrasting colours in the side panels, hood and pocket to match your club colours. We will be on hand to advise you where necessary on your hoody design to achieve exactly what you want. Hoodies cannot be ordered online. Minimum Order quantity is just 10.